[New for 2014] I hadn't been home from the store for very long when Nick sends a pic of something new he saw on the store shelf. He had bought something else instead but was regretting it a bit, so I said have no fear... I saw it, but I bought it! Business note: With 2014 upon us, it seems clearer than ever that Hood has basically broken their ice creams in to two categories. 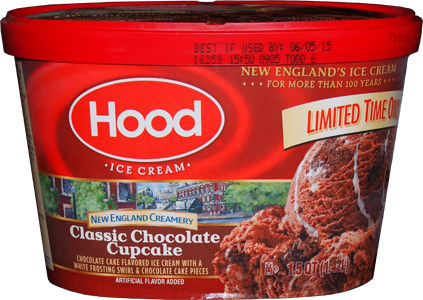 One is just labeled Hood and consists of regular / classic flavors. The other one is this emerging New England Creamery branding that is being infiltrated by more and more creative flavors. On top of this limited edition flavor we have here, there are already several out and several more in the pipe that have New England names and themes to them. My opinion? I like it. If you only distribute in New England, why not serve your clustomers with something the national brands can't give you. Sure it's still not premium ice cream (with a premium price point), but I really like this creativity that Hood is showing. First bite.... hmmmm. Second bite....ummm. Well, they said chocolate cake flavored base and this certainly isn't any standard chocolate base I've ever had. Thing is, my tastebuds are having a little trouble processing it. It's almost...spicy, like gingerbread spicy. It's not strong, but it's something. They succeeded in making it different, but it's going to take a little while to settle in. 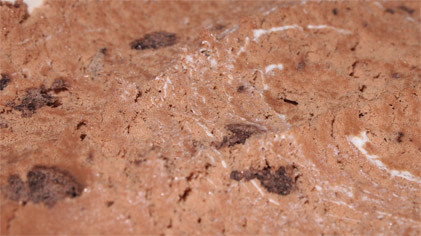 The cake bits are ok, not gooey, but not crunchy. They are kind of dry, but in a... gee, I don't even know what to compare them to. The smaller bits you don't notice it, but the big bits are definitely a different texture then your usual ice cream mix-in. You know how some oatmeal cookies have that spice or tang to them, that's what my brain is registering. I check in with my daughter and.... yeah, she's not really a fan either. I don't want to totally bash this flavor, I like when companies try to attack from a different angle, but this isn't going to be for everyone. I think in the right setting, say on a warm brownie, this might work better. 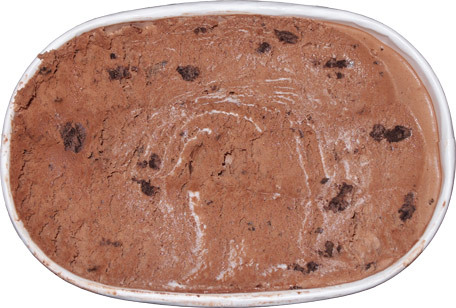 I'm just not loving it on the first scooping. So cute that your daughter refused a second bowl! Hope you and Nick get a chance to review the new Bryer's Gelato's soon. I have been eyeing them at Safeway. Anon, we have our eyes peeled for them. I've had no luck so far but Dubba has access to way more stores than I do so hopefully he'll stumble upon them soon!